A shirt with cuffs and collar (usually white) that are a different colour to the body is not easy to wear well. 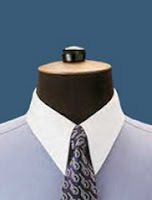 Sometimes known as a contrast collar, it is more often worn badly than flatteringly. It should be a slightly unusual part of a man’s outfit, rather than something that glares. The key, for me, is to wear it with a tie that is dark enough or colourful enough to push the contrast collar into the background. White collar and cuffs hark back to the days when both items would be removable. As the only items that would really be seen – the body buried beneath tie, waistcoat and jacket that was not removed – the collar and cuffs needed to be clean, smart and crisp. Hence the starch. Being detachable was very practical. The collar and cuffs wear out quickest, so having replaceable ones considerably lengthened the life of the shirt. Even today, Turnbull & Asser tell me that they frequently reinvigorate bespoke customers’ shirts by replacing the collar and cuffs with white ones (the original colour sometimes being out of production or difficult to match). But the men (usually bankers) that you see wearing them often look garishly, not to say cheaply dressed. That’s because the tie they choose is often too pale or too plain to draw attention. And the outfit becomes about the contrast between shirt body and shirt collar. So with a blue shirt with white collar, say, a pale blue tie or one with only a small geometric pattern is not going to be strong enough. If it were replaced with a navy-blue tie with silver club stripe, attention would shift to the tie and away from the collar. Pattern is as important as tone. Yesterday I saw a young banker wearing a plain black tie with a blue/white contrast collar. Aside from the fact that plain black will often look cheap, the lack of pattern ruined the combination. In contrast, I observed a slightly older man in the City wearing a dark grey tie against the same shirt, the tie patterned by silver paisley motifs. It was still subtle, but there was no question of the collar dominating. Think of the contrast between shirt and collar in the same way as you would the stripes of a suit. If the stripes are so strong that they dominate the outfit, the wearer is unlikely to look chic or sophisticated. And the tie is, in its way, a little like the pocket handkerchief: usually it is meant to stand out against the suit, just like a tie. The collar should not. Oh, and it goes without saying that the contrast collar and cuffs looks a lot better when you keep your jacket on. You can follow the discussion on Wear a contrast tie with a contrast collar by entering your email address in the box below. You will then receive an email every time a new comment is added. These will also contain a link to a page where you can stop the alerts, and remove all of your related data from the site.